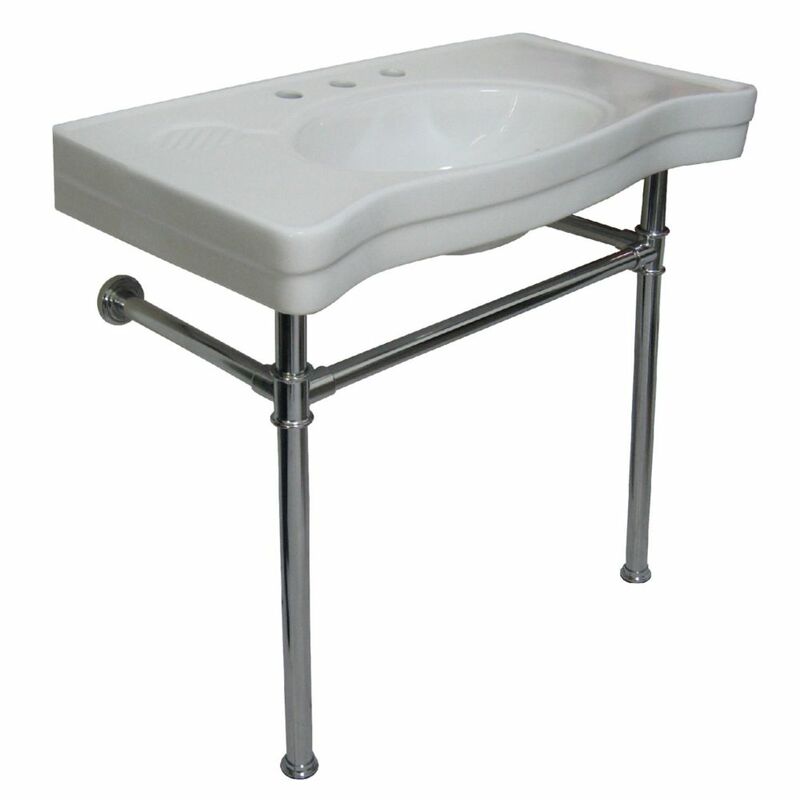 Pedestal bathroom sink with metal legs is a beautiful addition to any bathroom. The console sink is 36 inch W with 8 inch faucet drilling holes. The legs come in your choice of finish and are constructed of stainless steel. Archer offers a timeless appeal, blending subtle elements of Craftsman woodworking techniques and the intricate facets of jewelry. Distinguished by its beveled edges and clean geometry, the Archer sink creates a universal look that suits an array of bathroom styles. Pair this basin with the Archer pedestal for a brilliant overall effect. The Memoirs Suite with Stately design draws its inspiration from traditional furniture and architectural elements. The crisp, clean lines and moulded edges of this basin evoke the splendour of fine antiques. Pair it with the Memoirs K-2267 pedestal or K-6880 console table legs for a coordinated ensemble. Console Table Combo in White with Metal Legs in Polished Chrome Pedestal bathroom sink with metal legs is a beautiful addition to any bathroom. The console sink is 36 inch W with 8 inch faucet drilling holes. The legs come in your choice of finish and are constructed of stainless steel. Console Table Combo in White with Metal Legs in Polished Chrome is rated 4.7 out of 5 by 10. Rated 4 out of 5 by Djanne from Beautiful. Good quality for a good price. ... Beautiful. Good quality for a good price. Rated 5 out of 5 by Serguei from The space-saving vintage sink looks very attractive with a vintage... The space-saving vintage sink looks very attractive with a vintage faucet and chrome p-trap. It is very practical. But four legs would make it even better. Rated 5 out of 5 by Didi from This sink looks great in my powder room. I wanted a console sink that looked a bit more "updated... This sink looks great in my powder room. I wanted a console sink that looked a bit more "updated," and this fit the bill. We looked at similar sinks in specialty shops that were 2, 3, even 4 times the price, and I didn't even like them as much. Also, the top is oversized which is not only functional but very stylish. We had a professional install it since it does hang on the wall,etc. and is quite heavy. He had no issues. Rated 5 out of 5 by Mirna from Beautiful sink. Very sturdy and well made. I love the... Beautiful sink. Very sturdy and well made. I love the counter space. Rated 5 out of 5 by Anonymous from Great style! Love the final installed product. Looks good in my small bathroom. I think the price is fair but your plumber might charge you a little more because the sink is very, very heavy. Rated 5 out of 5 by Bricoleuse from I wanted a 1920's style skin for you WWII era house. This is perfect, and our contractor had no p... I wanted a 1920's style skin for you WWII era house. This is perfect, and our contractor had no problem whatsoever installing it. Rated 3 out of 5 by liamsDad from Just installed this week, 4/20/17, not in stock in the stores, purchased on-line, all of the part... Just installed this week, 4/20/17, not in stock in the stores, purchased on-line, all of the parts were packaged very well, I was concerned since it was shipped from CA to NC, but no issues. I did have a problem with the chrome cross bar under the front of the sink, there are two threaded holes that align to the two support legs, the holes were off that caused the legs to be off to the point you could not use them. I called the Kingston Brass customer support line hoping they could ship me a replacement part ASAP, since I had already demo'ed my bathroom, I was shocked when I was told that I should just return it to Home Depot and then order another since they do not stock any parts and could not do anything to help me. It took almost two weeks to have the first one to arrive, so I had to drill and tap new holes to make the legs align myself, came out great, but extra work I shouldn't have had to do. Rated 5 out of 5 by Patty from While my plumber complained it was heavy and hard to... While my plumber complained it was heavy and hard to install, i think it is a lovely sink and I am very satisfied with my purchase. I would recommend this sink if you are looking for this look in a sink.